KIEV, Ukraine -- The international human rights organization Freedom House says Ukrainian President Viktor Yanukovych of systematically eliminating any opposition before parliamentary elections scheduled for October 2012. "In 2011, Yanukovych launched a systematic campaign to eliminate any viable opposition to the ruling Party of the Regions ahead of parliamentary elections set for 2012." "Most importantly, prosecutors brought a series of charges against Tymoshenko, Yanukovych's strongest opponent, in a bid to secure a criminal conviction," stated a Freedom House report, cited by RIA Novosti. The document reminds readers that in October 2011 Tymoshenko was sentenced to seven years in prison for abuse of authority for signing gas contracts with Russia, a decission the opposition says was politically motivated, although the Ukrainian authorities deny this. Currently Tymoshenko is serving the sentence in a women's prison of Kharkov. President of the European People's Party (EPP) Wilfried Martens said on Friday that the EPP demands the immediate implementation of a European Court of Human Rights decision, which called for Yulia Tymoshenko's release. The report also reads that other political prisoners were placed or remained behind bars in 2011, including nine leaders of protests against the administration's tax policies and 14 or more nationalists involved in the beheading of a Stalin monument. Freedom House also noted that the attempts to mount street protests against the persecution of Tymoshenko and other former government officials, including former Interior Minister Yuriy Lutsenko, were met with a heavy police crackdown. Lutsenko, an ally of jailed opposition leader Yulia Tymoshenko, was arrested in December 2010. In late February he was sentenced to four years in prison for illegally employing and giving an apartment and pension to his former driver, as well as of overspending government funds during Police Day celebrations in 2008 and 2009, when he was in office. In addition international human rights organization Freedom House noted that working conditions for media in Ukraine got worse. "The constitution guarantees freedoms of speech and expression, and libel is not a criminal offense. Business magnates with varying political interests own and influence many outlets, while local governments often control the local media. 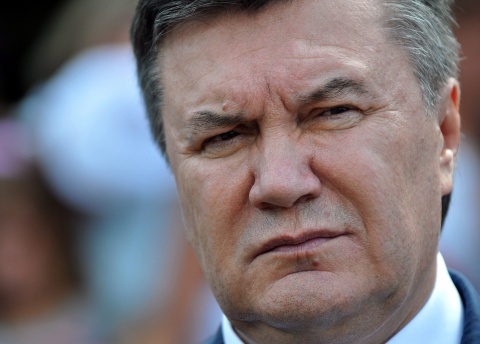 Conditions for the media have worsened since Yanukovych's election." Some 69% of Ukrainians get their news from television and the medium now features fewer alternative points of view, open discussions, and expert opinions, says the report of Freedom House.